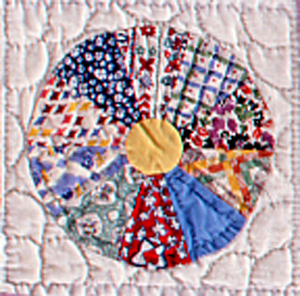 Dresden Plate quilt appears to come from the image of well-known porcelains like Meissen or Dresden produced in Dresden, Germany. 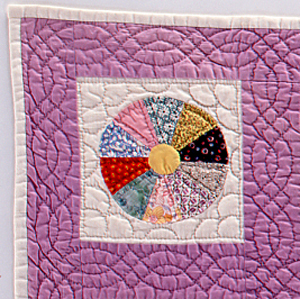 Vegetable dyed purple fabric was used as a base, and pieces were stitched to white square blocks, carrying out delicate circular design. As a bonus, rope embroideries were done on the purple base. Each ninety blocks were constructed to have images of going around kaleidoscope.